Today saw history being made and dreams come true. 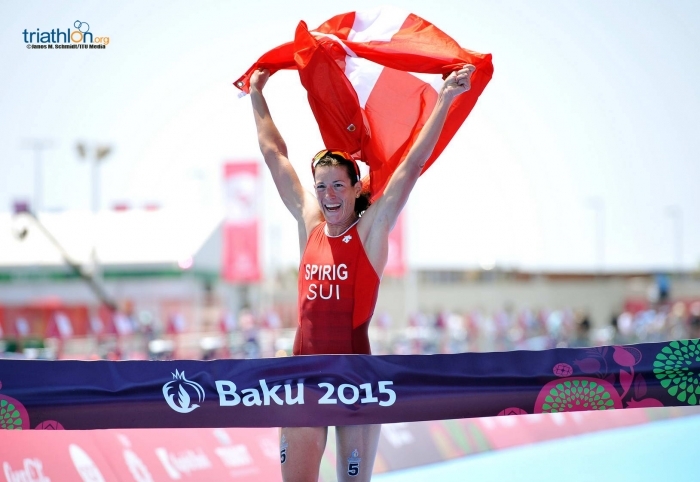 Today was the day that gold, silver and bronze were won at the Women’s Triathlon at the Baku 2015 European Games. When the idea of holding a “European Games”, like the Commonwealth Games, or Asian Pacific Games was proposed, it was our sport that was first to come on board. It was our sport that gave such impetus to the whole notion of European nations joining together in sporting challenges. Today, as the athletes and coaches lined up, looking out to the rough seas, there was more than a frisson of concern. The winds had changed direction and were now pushing across the swim area with such force that the Technical Delegates, with the LOC, made the decision to keep the athletes in the water for the entire swim, rather than allowing them to come up onto the beach for the turn-around before their second lap. Coaches, Team managers and athletes were advised, as were the crowds of spectators who made their way down to Bilgah Beach for the race. Water at 22.5c and air at 26c; it was going to be hot for everyone. The athletes were presented to the crowds; the cheers rang out for each athlete as they made their way down to the start area and then the heartbeat started. Tension, already high, went skywards and then they were off. The first 80m saw the athletes running, wading and using that tiring “dolphin” movement, to get to deeper water. On the left of the field, it was Rachel Klamer NED, Anastasia Abrosimova RUS and Lisa Nordén SWE, who made the first impression out in the very choppy waters of the Caspian Sea. This is a sea but the water is not salty. So, with a non-wetsuit swim and the strong waves and current, this was going to be a bad place for anyone who was not a strong swimmer. The first buoy saw these three athletes take control of the swim before they headed back to the shore. The turn for the second lap saw the athletes being tossed around and it was not long before the Swedish athlete was dropped. A swift T1 saw a Dutch-Swedish-Russian break out onto the roads but the Russian was soon dropped. The winds were making it a tough race for everyone but the chasing pack had someone on it who goes for “tough”. 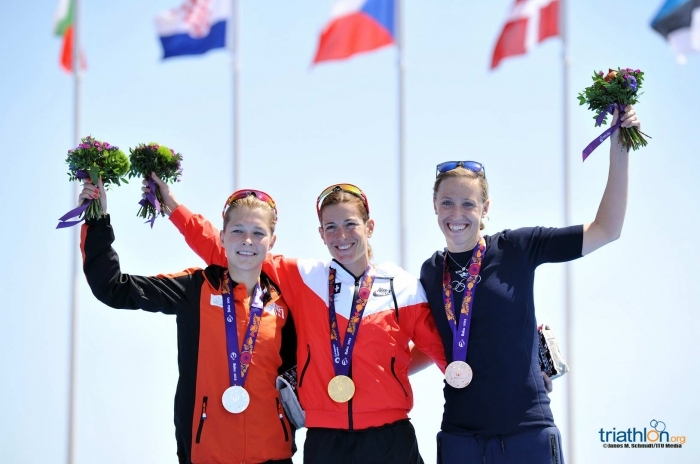 Olympic Gold medal-winner, Nicola Spirig SUI made her mark by breaking free of the pack she had been leading and easily joined the leading duo. The three athletes; Olympic Gold, Olympic Silver and the young, promising athlete from the low countries, piled on the power and made it to T2 with a comfortable advantage over the other athletes of some 2 and a half minutes. T2 was again swift, efficient and clean for the leaders. Switzerland, Sweden, Netherlands but within a few strides, the race was in Spirig’s hands. A demonstration of pure power took Spirig to the finish line. A hand reached out as the came to the carpet; a welcome hand from someone who knew her well and then it was a magnificent few strides down to take the finish tape to the cheers of the spectators and to take the gold medal in 2:00:28. It was left to Klamer and Nordén to battle it out for the final podium spots, with the former having just enough in her legs for a sprint finish. The 24 year old clocked 2:01:44 with Norden two seconds adrift. For Klamer, “I found the bike really tough – Nicola and Lisa were helping me out and I tried to do the same for them. The run was exhausting too – it was so hot and I didn’t have a lot left to give. The Azerbaijan fans were overjoyed to see their own athlete, Kseniia Levkovska take 17th in a sprint for the line, only just losing out to Abrosimova, who had worked so hard in the swim but beating Paulina Kotfica POL by just one second. Perhaps tomorrow Azerbaijan might just shake up the top ten. ITU President, Marisol Casado, was present to represent our sport globally but when speaking after the event, she made it clear that she was proudly European and pleased that triathlon had been such a great success at these European Games. The race had been seen by Thomas Bach, the ninth and current president of the International Olympic Committee. She recognised the joint work between Gergely Markus, who was also present and ETU President, Renato Bertrandi that resulted in the two direct entry slots for the Olympic Games in Rio. Athletes made their way back to the Athlete Village knowing that they had made history today whether they made it to the podium or not. Spectators went away knowing that they had seen history being made. The Azerbaijan Triathlon Federation saw their dream come true and ETU Triathlon is today a proud place to be. The men’s elite race will begin at 12:30 (local time) tomorrow afternoon (Sunday 14 June). Follow @ETUtriathlon to hear how it unfolds, live from the course.